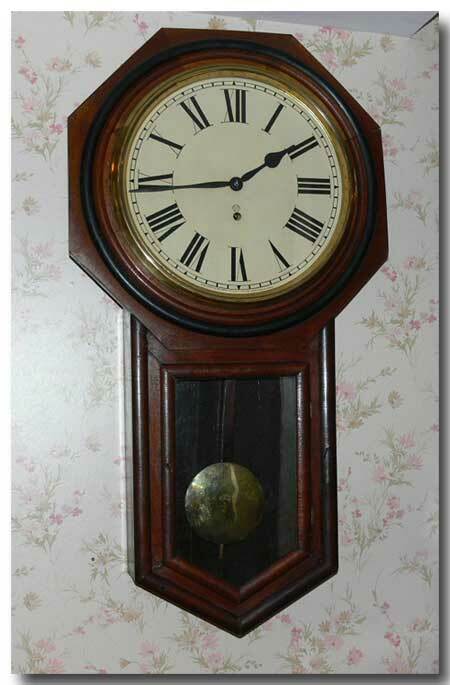 MADE BY THE ANSONIA CLOCK CO., NEW YORK, N.Y. MODEL ” REGULATOR A”. ORIGINAL DIAL AND STEEL HANDS. 14 DAY TIME ONLY BRASS MOVEMENT IN WORKING CONDITION. BRASS BEZEL WITH A BLACK BANDED SURROUND ON A SOLID, BLACK WALNUT CASE IN THE OCTAGON SHAPE WHILE THE LONG DROP IS VENEERED IN WALNUT WITH A FEW SMALL MISSING PIECES AT LOWER END AND THERE IS A SLIM VERTICAL AGE CRACK ON THE BACKBOARD WHICH DOESN’T SHOW UP IN THE PHOTO. APPEARS IN THEIR 1906 CATALOGUE BUT MAY HAVE BEEN MADE AS EARLY AS 1901 OR AS LATE AS 1910. APPROX. SIZE IN INCHES: 32 H X 17 W. WITH A 12 “ DIAL.